I thought long and hard about doing this review because I didn’t actually know what to say about this foundation. I bought it a few months ago in a large store and ever since I just haven’t been sure. To me it’s like one of those people you meet who you get along fine one day and the next they have just changed in to this evil being. Which Foundation am I reviewing? As you may know my skin is strange. It’s super dry one day and then it’s super oily the next. It has some serious issues going on but, I do always keep whatever it has going on under control. My skin is always quite difficult to blend with. I don’t know why, I should probably ask a makeup professional but, it is. I didn’t get along with my Beauty Blender, I wrote a review on that here if you didn’t see that. I also have quite freckly skin so, choosing the right color can be hard as aside from the freckles I have a lot of colors going on. I had to get you knowing/feeling what my skin was like before we proceeded. Of course my skin is quite difficult but, as a foundation I feel like you should be able to work with what you’ve got. What happened The First Time I Used It? The first time I used this foundation was on the back of my hand in the store. It was in the middle of the summer so I was way more tan than I am now. I can still get away with the color now (I bought the color ‘sand’) but, I have to use bronzer and really buff my neck with all the product so, I don’t use it unless i’m going out. Anyway, the first time I used the product I was really happy with it. It looked great on the back of my hand, it was full coverage and I even left the store and went back later to see my hand was still covered in the foundation and looked ‘flawless’. It was expensive for me as I paid around 13 euros. I’m aware you can get it much, much cheaper online so, I won’t make that mistake again. But, it looked great on my hand, I needed a new foundation and I thought why the heck not? What Happened The second Time I used It? I’ll admit, I don’t always moisturize my skin before applying foundation, I know that’s bad and if you don’t moisturize it makes things not as great but, sometimes I just don’t have the time or the patience to wait around. This particular day however I decided to use my new Maxfactor foundation. I did in fact apply moisturizer because I remember wanting my skin to look perfect. As I applied it, it dawned on me that I looked like an orange faced freak. I absolutely hated it. I rubbed it all off, tried again and still the same result. I was sooo dissapointed because I was so excited to try it out because it had been so perfect in the shop. I pretty much gave up on the foundation and forgot about it until a few weeks ago when I ran out of my usual . I bit the bullet and tried the foundation again, I pretty much had to as I had nothing else and needed some on. I braced myself as I glanced at myself and surprisingly it looked great. I was so shocked that I thought maybe I had got confused but, seriously it looked good. I don’t know what had happened, I don’t know if my skin color had changed or I just was working well with the texture of the foundation that day but, I loved it. It was really high coverage (something I love) it stayed on all day, it worked well over my spots, it was just an all round great foundation. This did however leave me extremely skepitcal about purchasing it again. I have sinced used the foundation and I do when i’m going out or just need that little extra coverage and it’s worked well ever since. All I can think was my skin tone was just a little off that particular day and the color wasn’t what I was used to. I will definitely buy this foundation again, online this time. It’s great, it’s full coverage, it contains an SPF 20 something we should all look for in our foundations. It lasts all day and although it is a little pricey it’s worth it as you only need a small amount. It acts as a primer, concealer and a foundation all in one so, if you didn’t own that much makeup you wouldn’t need anything but this one foundation for your face. There’s a variety of colors to choose from and it comes in a pump bottle. I cannot stand pouring bottles! Obviously my first con would be the issue in the beginning. I don’t think it was anything to do with the product but more with my skin and how difficult it can be. The next thing was that I did find too much can make your skin a tiny bit cakey if you apply too much setting powder or concealer over the top. Of course this is a thick, high coverage foundation so it isn’t going to react to well to more products being mixed in with it! I would always recommend a moitruzier to be applied before applying this foundation as it is thick but, apart from that I can’t think of any other cons. Overall, it’s a great high coverage foundation and I would definitely buy it again despite the issues I had at first. 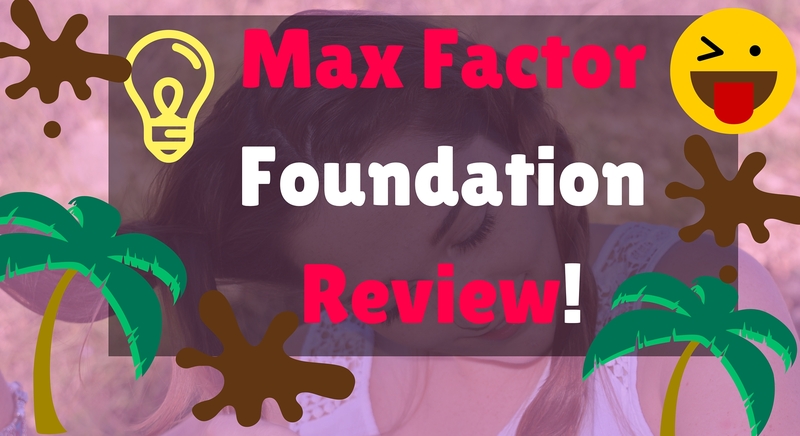 I hope you enjoyed my Max Factor Foundation – Review, if you did please let me know in the comments below!